pauvrotso_0 has no other items for sale. Saddle came right away. Unfortunately was not a good fit for our horse and the seller does not do returns so I was stuck trying to resell. Thankfully and appreciatively the seller contacted another interested buyer to contact me and I was able to sell. Very grateful to the seller for the assist! Best saddle I’ve ever owned. light weight, beyond comfortable, can ride for hours with no fatigue or soreness So glad I made this purchase! Circle Y ~ quality and affordable. 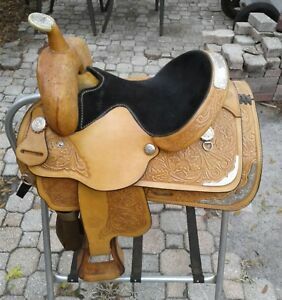 This saddle looks great and my daughter says the saddle is comfortable. The silver looks great even after several years (we purchased it used). I highly reccommend the Circle Y saddles. Maintains shine if properly oiled. Love my new saddle. Very comfortable. As described. Received in a timely manner. All good. These saddles are always comfortable and fit most horses. They break in easily and the stirrups are comfortable even from the start due to the way they are turned and wrapped. I highly reccommend these Circle Y saddles as a good mid level show saddle.